Diet for Diabetes. 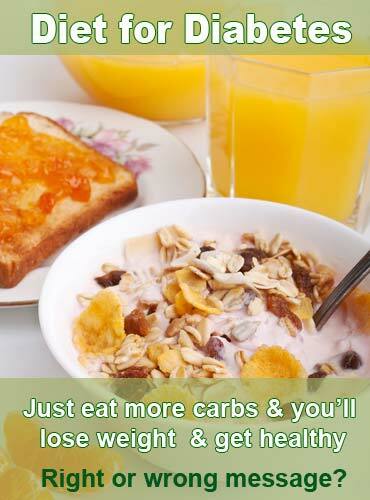 Just Eat More Carbs, You’ll Lose Weight & Improve your Health?! I have been in a bit of an outrage for the past few days because I honestly can’t believe how demended our world can be sometimes! I’m doing a Masters in Nutrition and I was attending my lecture on a topic around type 2 diabetes. We were talking about diabetes diet prescription and the lecturer put up on the screen an example meal plan. I almost died. I had to come and write about it on the blog because I just can’t believe what is happening in our world. The meal plan: Breakfast alone consisted of 2 weetbix, 2 pieces of toast and 150ml fruit juice! Um…excuse me, but did you know that all of those food items are carbohydrates that all become sugar and sugar pushes up your blood sugar and insulin levels? And fruit juice…really! If you think fruit juice is healthy, you might want to read this. I’m really shocked because she is supposed to be the “knowledgeable” lecturer! She mumbled and stuttered and really had no practical answer for this. And by the way miss lecturer, did you know that vegetables are carbohydrates? Maybe you could include a few of those in your meal plan instead of a whole bunch of processed junk! The common diet prescription is to eat more carbs. Dieticians, diabetes educators, doctors, and lecturers telling you to eat more carbs and you’ll lose weight and improve your health. Eat more carbs and less protein and fat. This is not imagined, this is exactly the kind of information people are being given. There’s only one issue with this prescription. IT IS NOT WORKING! Seriously, the nutritional information that is being given to people about diabetes is all WRONG! You don’t have to be a rocket scientist to work it out, it’s common sense. Have you got diabetes and been prescribed this diet? Have you been managing your diabetes on this type of diet or are your sugars out of control? I tell you what, I’m super passionate about changing this ridiculous message because people are dying from this disease so I’m definitely going to be covering this topic a lot in my new podcast (due to launch very soon).